(San Luis Obispo County, CA) â€“ If you havenâ€™t yet acted on your New Yearâ€™s resolution to rekindle romance with your partner, San Luis Obispo Countyâ€™s got you covered this Valentineâ€™s Day and beyond. Located mid-way between San Francisco and Los Angeles on Californiaâ€™s Central Coast -- San Luis Obispo County â€“ known as SLO County to the locals -- invites lovers to slow down and savor the moment with pure play.After a visit to our soul-stirring beaches, pristine forests, majestic mountains and charming coastal and wine country towns, couples will learn why our area in recent years was named the â€œHappiest Place in North Americaâ€ â€“ and take that feeling home long after Valentineâ€™s Day is over. Madonna Inn, San Luis Obispo:Starting at $847.65 the â€œRustic Romance Packageâ€includes a scenic horseback trail ride, overnight stay in one of the celebrated themed rooms, bottle of champagne, personalized mini-heart cake, one-hour coupleâ€™s massage, $100 dining credit from Gold Rush Steak House and more. Good throughout February. The Cliffs Resort & Marisol, Pismo Beach:Get in the mood with the â€œSuites for your Sweet!â€ package, starting with a three-course Aphrodisiac Dinner prepared by Chef Wangard. Have dessert sent up to your oceanfront suite, where red wine and other indulgent treats await during your overnight stay. Offer is good Feb. 14-16 and costs $459. Package available in February without dinner starting at $249. Blue Dolphin Inn, Cambria:Wine and waves lovers can book the â€œCoastal Romance Packageâ€ which includes a two-night stay and a four-hour Wine Wrangler Tour of Paso Robles, which was just named2013 Wine Region of the Year. Starting at $425, the package also includes a complimentary bottle of wine, artisanal chocolate-covered strawberries and gourmet Picnic Breakfast to Go. Paso Robles Hotel Month: During this special month, lovers canâ€œStay Two Nights and get the Third Night Freeâ€during February and get a bottle of local Cabernet Sauvignon wine and special amenities from each of the eight participating hotels. Click here for more hotel packages. Nature Corps&apos; Valentines Eco-Voluntours & Wine Tasting Weekend, Morro Bay: Find romance through voluntourism Feb. 14-16, where couples can restore beautiful coastal habitat, go wine tasting, kayak on the bay and tour Hearst Castle. Book by Jan. 31 and save $200. Margarita Adventures, Santa Margarita: Sweep your sweetie off their feet with a â€œZipline Tour of the historic Santa Margarita Ranch.â€ For just $99 per person, youâ€™ll soar over vineyards, learning about the ranchâ€™s sustainable winegrowing practices, wildlife habitats and role as part of Californiaâ€™s famed Mission Trail. Cap it off with a tasting at Ancient Peaks Winery. Breakaway Tours, Paso Robles/San Luis Obispo:Be your own Valentine with a â€œSingles Only Wine Tourâ€in Paso Robles (Feb. 15) and/or San Luis Obispo (Feb. 16) and make new friends.For just $119 per person, these five-hour tours include tastings at several wineries, a winery picnic lunch, candy and wine pairing and a fun surprise at the last winery. Point San Luis Lighthouse Tours, Avila Beach:Set in Avila Beach â€“ recently named amongSunset magazineâ€™s Top Winter Wonderland destinations â€“ these trolley tours of the historic lighthouse make the perfect romantic setting. Hearst Castle Tour â€“ Travel back in time and experience Americaâ€™s renowned castle on the â€œEnchanted Hillâ€ in San Simeon.Famous for William Randolph Hearstâ€™s celebrity-packed parties, you can easily imagine Charlie Chapman, Clark Gable and Greta Garbo walking the romantic grounds. Tours start at $25 per person. If you want to really wow your Valentine, pre-arrange a private four-hour tour of the Castle for $750 (up to three couples in one tour). Click here for more activity packages. Please call partners directly for the most updated information. 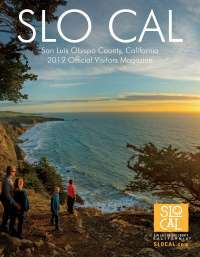 For more information on pure play year-round in San Luis Obispo County, go to www.VisitSanLuisObispoCounty.com.